Powers/Abilities: Superhuman strength. Able to arouse passion and love in people at will. History: (Venus #1-19, Marvel Mystery Comics #91) After World War II, the Goddess of Love, Venus, decided the world needed her powers more than ever, and travelled down from Mount Olympus to bring love to the world. She apparently set up home on the planet named after her, where she was served by the likes of Cleopatra, Helen of Troy and Salome. Comments: Venus returned in the Silver Age, where she has been firmly established as part of the main Marvel Universe. 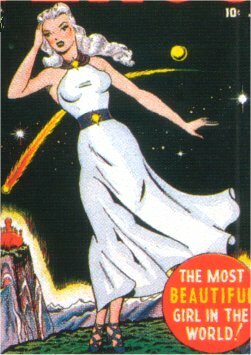 Since there is an excellent profile covering most of her Golden Age and all of her Silver age appearances on the Appendix to the Marvel Universe site, I don't see any point in repeating them by detailing it here, and thus this entry is just a very basic summary of her Timely appearances. Thanks to Jess Nevins for allowing me to use information from his excellent Golden Age Heroes Directory and his Guide to Golden Age Marvel Characters. Thanks also to Richard Boucher & Darrin Wiltshire @ PR-Publications for permission to use information from their equally brilliant collection of Golden Age Sites, PR Publications. Their knowledge of Golden Age characters far outstrips my own.